Scientists at the University of California, San Diego, have designed tiny spherical particles to float easily through the bloodstream after injection, then assemble into a durable scaffold within diseased tissue. An enzyme produced by a specific type of tumor can trigger the transformation of the spheres into netlike structures that accumulate at the site of a cancer, the team reports in the journal Advanced Materials this week. Spherical nanoparticles labeled with red or green dye shift their shapes and accumulatte into netlike structures when they encounter a protease secreted by some kinds of cancerous tumors (Click on image for larger view). Targeting treatments specifically to cancerous or other diseased cells depends on some means of accumulating high levels of a drug or other therapeutic agent at the specific site and keeping it there. Most efforts so far depend on matching a piece of the drug-delivering molecule to specific receptors on the surface of the target cell. Inspiration for this new strategy came from biological systems that use shape to alter the ability of something to lock in place or slip away and escape, said Nathan Gianneschi, a professor of chemistry and biochemistry, who led the project. Some cancerous tissues produce high levels of a class of molecules called MMPs, for matrix metalloproteinases. These enzymes change how other proteins behave by altering their molecular configuration, leading to metastasis. 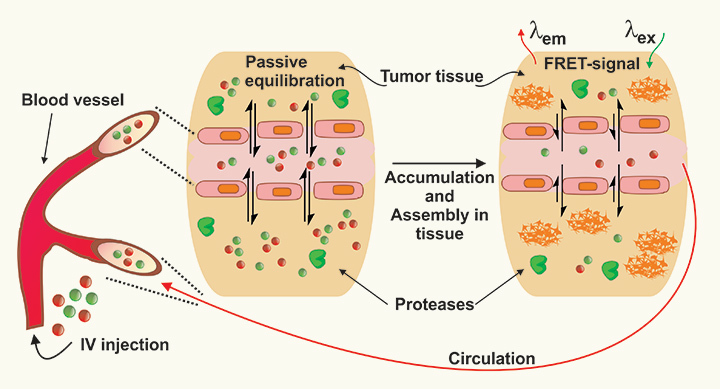 Gianneschi and colleagues harnessed this ability to alter their nanoparticles in ways that would cause them to linger at the site of the tumor. “We figured out how to make an autonomous material that could sense its environment and change accordingly,” Gianneschi said. Each nanoparticle is made of many detergent-like molecules with one end that mixes readily with water and another that repels it. In solution, they self assemble into balls with the water-repellant ends inside, and in that configuration can easily be injected into a vein. When mixed with MMPs in vials, the enzymes nicked the peptides on the surface of the spheres, which reassembled into netlike threads. The team tested the concept further by injecting their new nanoparticles into mice with human fibrosarcomas, a kind of cancer that produces high levels of MMPs. To mark when the spheres broke down to form other structures, the chemists placed one of two fluorecent dyes, rhodamine or fluorescein, inside the spheres. In close proximity, the dyes interact to create a specific light signal called FRET for Förster Resonance Energy Transfer, when energy jumps from rhodamine to fluorescein. Within a day they detected FRET signals indicating that the spheres had reassembled at the sites of the tumors, and the signal persisted for at least a week. The treatment is not inherently toxic. It did not appear to change the tumors in any way, and liver and kidney, the organs most vulnerable to collateral damage from treatments because they clear toxins from the body, were normal and healthy eight days after injection. Different versions of these nanoparticles could be designed to respond to signals inherent to other types of cancers and inflamed tissue, the authors say. The spheres can also be engineered to carry drugs, or different diagnostic probes. Right now, this same team is developing nanoparticles that carry an infrared dye, which would enable them to visualize tumors deeper inside the body along with other materials that can be imaged with instruments commonly available in the clinic. Co-authors include Miao-Ping Chen and Matthew Thompson in Gianneschi’s group, and Christopher Barbak and David Hall in UC San Diego School of Medicine’s Department of Radiology. Funding agencies include National Institutes of Health, Army Research Office and Air Force Office of Scientific Research. Gianneschi was also supported by a New Faculty Award from the Henry and Camille Dreyfus Foundation and a Research Fellowship from the Alfred P. Sloan Foundation.